This post is about the best cheap hotels in Iran. In preparing my trip to Iran it was sometimes hard to find information on budget hostels for backpackers. Many hotels in Iran do not have an internet presence and those who do are rather expensive. 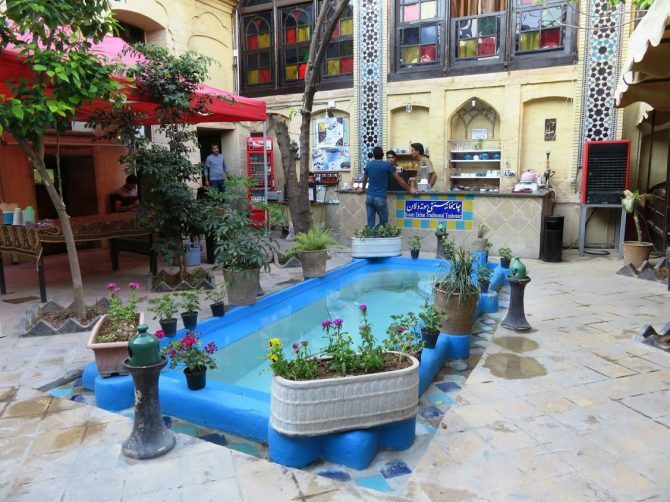 Backpacker hostels are still very rare, but with tourism on the rise cheap hotels in Iran are opening up throughout the country. The demand for cheaper places to stay is high and most cities now have one or two budget hostels geared towards backpackers. Because of the high demand making reservations for cheap hotels in Iran, if possible, is recommended, especially in the high season. Therefore I decided to share my final top ten list of places I stayed or visited based on my own experiences. Note: I was not sponsored or given discounts to write any of these reviews. They are based on my own experience and hostels were not aware that I was a travelblogger. This post also does not contain affiliate links. If you are a hostel owner in Iran, I am happy to add hostels to the alternative places to stay. For my readers, be aware that my only experiences are with the hostels that I described. By far the best place I stayed in Kashan was Ehsan house. It is a traditional house with a lovely courtyard. Staff is friendly and they can help you with everything. There is a lovely breakfast buffet included in the price and the restaurant offers a varied menu of traditional Iranian food that is not always easy to find in other restaurants. This is your chance to taste delicious fesendjoon or gorme sabji. It is centrally located in a quiet alley opposite the Agha bozorg mosque. It’s on walking distance from both the bazaar and the old traditional homes. There are lovely decorated private and double rooms and for backpackers there is a lovely dormitory with 6 beds (500,000 rials as of April 2016). This place is on number 2 mostly because of its restaurant. The hotel has a wonderful rooftop restaurant with a beautiful view on the blue mosque that serves delicious food. They have a varied menu including vegetarian options. Try Shuli, a soup speciality from Yazd or try camel meat. Besides the restaurant the Orient hostel has nicely decorated rooms and a lovely courtyard. For backpackers there are dormitories including a female only dormitory (500,0000 rials as of April 2016). another good place for the budget minded traveller is the Silk Road Hotel. Read more about the best of Yazd: the gateway to Iran’s desert. This hotel is a bit overwhelmed by its own success and is therefore only on number 4. The rooms are all nicely decorated, the dormitory is nice and cheap (300,000 rials as of April 2016) and it has the best breakfast buffet I had in Iran. The restaurant also has a nice menu with delicious food. Try kallam pollo, a speciality from Shiraz. The service is a bit mixed tough. Some staff are extremely friendly others are a bit indifferent. This homestay like hostel with a very friendly and helpful owner offers two rooms that can either be booked as a private room for 20 euro or as a dormitory style room for 10 euro per bed (as of April 2016). This includes breakfast and tea. Probably one of the cheaper places to stay in Esfahan. It is a bit outside of the city center and a bit difficult to find, but it is actually quite easy to get there by local bus. The owner will explain how to get to the centre by bus (5 minutes) or by walking (30 minutes). He might not always be open as he closes when he is out of town, but if he is there it is a very good option in Esfahan. Read more about the best of Esfahan: the blue pearl of Iran. The only real backpackers hostel I stayed in Iran deserves place number 5 for its extremely helpful and friendly staff. No pictures are included as when I visited they were still in their old place in a really tiny building. Have a look at Tehran bazaar in pictures. Hotel Koosaran has no presence on the internet. It’s on number 6 for its amazing location. True, the hotel itself is nothing special. It is a small dormitory style room with 4 beds (300,000 rials as of April 2016). The balcony outside with the view on the mountains is amazing though. The homemade food is a very welcome change from all the kabab. The lady who runs the place is quite a character herself. She might come across as a bit grumpy at first, but try to break the ice and you will find out she is a lovely person. The guestbooks are a wealth of funny traveller stories and useful advice on hiking possibilities around this small lovely village. It is easy to hike up from here to the Alamut castle. Don’t expect much from the castle, but the views are amazing. Read more about the Alamut Valley: a lost mountain paradise and the castle of the Assassins. Another hotel without any presence on the internet. In the less touristic central and western parts of Iran you are most likely to stay in the so-called mosaferkhaneh’s or mehmanpazir’s. Local guesthouses used by Iranian men or families. Read more about Kermanshah & Hamedan: history in Central Iran. All budget places in the lonely planet were closed. I decided to try out the Hedayat hotel. As expected of most mosaferkhaneh’s this place does not earn any award for cleanliness. However, people were very friendly and therefore it still made it into this list. Read more about Iran’s Kurdistan: Sanandaj & Palangan. Read more about Gilan & Masouleh: the way to the rooftop of Iran. My first introduction to Iran was a nice one with Mashad guesthouse. Again it is a typical mosaferkhaneh. Shared bathroom facilities, not too clean, but friendly staff and centrally located near the bazaar. Single room for 300,000 rials (as of April 2016). Read more about the best of Tabriz & Kandovan: a warm welcome to Iran. Do you have the contact details and email of Mashad GH in Tabriz? This post comes just as the right time! I’ll bookmark and use it as my travels start in less than 4 weeks! Thanks Ellis. You will have a great time. Iran is wonderful. Thanks for mentioning our hostel in your blog. Only just saw this post and have just left Iran. However as it turns out I stayed in quite a few of your recommended places anyway and agree with them all! Iran is always a place that has tempted my soul – and Im glad to find it can be done on a budget! These all have that cheap chic feel to it and I love the use of swimming pools which I imagine must have a nice cooling feel! Thanks for inspiring me today! I must admit that the pools in the pictures are more for decorative purposes.